During the last two weeks in January of 2010, the jazz media flooded the avant-garde jazz public with descriptions of the persona of Matthew Shipp in anticipation of the release of his “last” solo recording, 4D, scheduled on the 26th of the month. JazzTimes featured a story; Signal to Noise did a cover story; and AllAboutJazz.com published a piece, which I wrote. Several blogs, as well as Bulletin Boards, were delving into conversations about Shipp’s profane language, his casting aspersions on his elders, his self-involvement, his arrogance as well as the sheer amount of coverage given to the musician. In this entire hullabaloo, as I remember it, the music was only touched upon. My feature centered on the recording session for 4D in May of 2009. The experience was unique for me; I went because I never thought that I would have another opportunity to share in this process. I did not take notes at the session. I absorbed as much as I could with my eyes and ears. When the challenge to write the article for AAJ arose, I had to do everything I could to integrate the information necessary to produce a full-bodied article. Months of listening to Shipp’s solo records and the promo CD, interviewing Shipp on the phone and exchanging emails, when gaps needed to be filled, were critical to the writing. Shipp’s solo music from 1995 on to the present clearly spoke of its evolution. It was obvious to me how experiential influx moved him to render his sound. From album to album, the music shifted in delivery even in the smallest of increments. Out of the six solo records, the most noticeable change occurred between Songs of 2001, and One of 2006. Granted several years passed between the two records, nonetheless, a rebirth had taken place. Shipp’s essence entered the grooves of One. It was if he had gritted his teeth and leaned into a full force wind. It was the first record for which he seriously composed both lead sheets and heads. The music was written down. It was embedded in stone, in perpetuity; it was repeatable. He had reached one of those moments in his musical life when he had taken an extra step, similar to the step a visual artist takes when he knows that he has to buy a better brush to paint with or a better grade pencil with which to draw. It is at those times in the creative process when the artist is seizing onto shaping the quality of his work. A cycle has completed itself. A cycle of discovering has concluded and has broken through a wall in order to continue. It is not easy to face these moments because they are filled with questions and inherently uncertain. Yet, with the answers to these questions comes a sense of relief that passes quickly and morphs into a kind of truth. The truth is the artist is irrevocably wedded to this “thing” he has made. Its future is infinite. And the artist assumes the responsibility for taking his creation as far as he can. Un Piano, from RogueArt in 2007, became a tangible stepping stone from One to 4D, both from Thirsty Ear. In Un Piano, he crystallized his musical language so that he could see it again with a sharper focus. Shipp continued to examine his language so closely that he knew how he had to prepare to record 4D. Traditional methods of practicing led him to the place he wanted to go: a place where details became the most important aspect of fulfilling his goals for the kind of sound he wanted to create. He had established a new plane from which he could spring. That plane was seamless, a sheet of glass. He could break away from it, but he knew he could reincorporate himself with the main road. His landscape was dimensional, full of breadth, height and depth and the nooks and crannies that were invisible until he came upon them in improvisation or in the choices he made from one track to another. 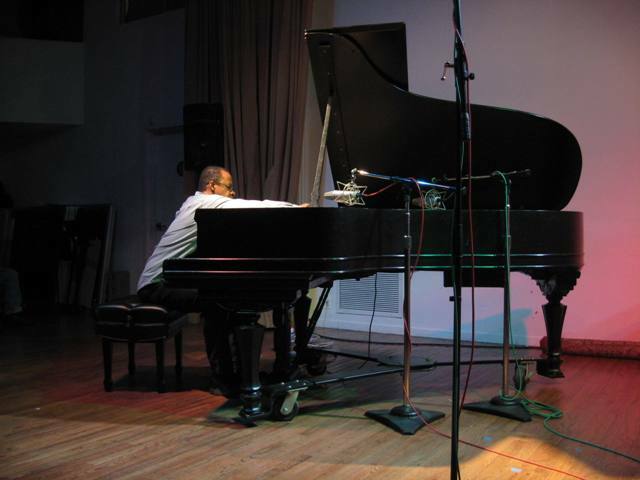 Seven months lapsed between the recording session for 4D and the CD release concert, both held at Roulette. The room for the concert on January 28th was filled. The concert started fifteen minutes later than its scheduled time. Thirsty Ear’s founder, Peter Gordon, introduced Shipp. He mentioned that the audience was in “the place where all the magic had happened…” He was right. Magic had happened on that day in May of 2009. But more was to come. Shipp came out of nowhere and took a signature deep bow before he sat down on the bench in front of favorite piano in New York City. Two seconds passed before he touched the piano. He had no reason to be concerned with stopping and starting, constrained by track length. Rather he had an entire blank sonic canvas in the eighty-eight keys before him. In the time that followed, Shipp travelled through familiar territory stylistically, but he stepped into zones that were outside of 4D.The transitions from abstract to lyrical happened in varying tempos. The shape of the continuity changed constantly; he let the breaks in the sound release him from the direction he was in the midst of taking. He was using rhythm and melody to transform a metaphorical space. From the beginning to midway in the set, it was as if Shipp had brought the audience through galaxies of stars, the darkness of the bass chords as effectual as the lightness of the twinkling treble notes. The prevailing idea of being nowhere and everywhere at the same time translated through the power of the sound’s flow as it fell into every extreme from high pitch to low, from fluid to dissonant and disparate, from intense to lullabye-like, from syncopated to separated, from heavily chordal to accented with cutting single notes, from being filled with clusters to settling into articulated phrases. The head from “Gamma Ray,” from One, signaled that Shipp had reached another soundscape, where he was earthbound. The tonality became less ethereal. He reached into the piano and plucked a midrange string hard; he returned to the keyboard to play a lyrical interlude, stopped, and went back inside the piano. His fingers returned to the keyboard. He had arrived at a lyrical oasis. But the conversation between harmony and abstraction ensued. His hands alternated chords. He modeled ostinatos. He bounced on the piano bench anxiously. His face had passed though grimaces; he had mouthed his musical thoughts as he played. Then the densely packed music suddenly spread out. He was in ‘a state of grace;’ the description Jackie McLean had once assigned to Bud Powell and Thelonious Monk upon seeing the two in Paris. Shipp played the theme of “Equilibrium,” from the album of the same name. He stopped a whole note’s worth and played the theme again. He did this several times quietly, peacefully. And then he simply came to rest. The set was over. It had lasted exactly sixty minutes. The cycle he had completed with the recording of 4D was moving forward. Shipp was recharged. This concert marked the onset of yet another dimension of exploration. In art making and music making, agony and decisiveness go hand in hand rather than contradict each other. If it were not for the dynamic between the two, the art and music produced would be boring and flat. In the real world, Shipp has too much on his mind. In his emotional world, he has become so much a part of the spiritual and epistemological universe that the state of his music can reflect nothing but transformation, out of how it already exists, one cycle at a time.